B: Hello, you guys. In today’s program, we will introduce you to Bolognese, whose origins are believed to be traced to the area of Bologna, Italy. This dish is most often made with minced beef and fresh tomato purée, then cooked low and slow for a few hours to develop a rich, hearty taste. A: With some common ingredients, Bolognese is a perfect dish to make for guests when you need an easy and impressive meal, as it is simply served over cooked pasta, and is also great to make in batches to reheat for another night. 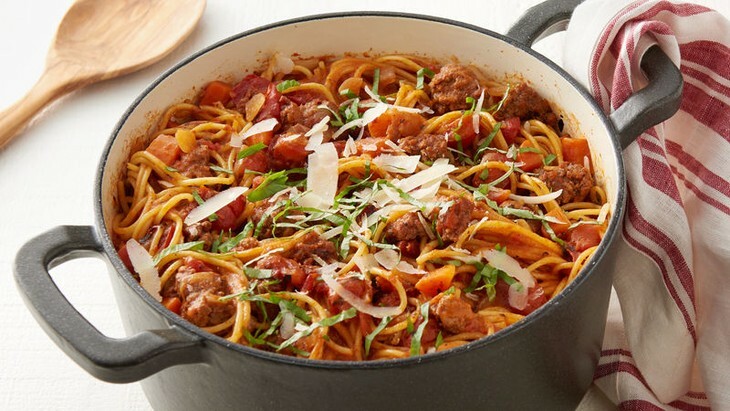 B: Some people just add some ground beef to a tomato sauce and call it Bolognese while some follow several steps and techniques to create the dish’s rich flavor. Abby Chitty, a student from the UK, told us about her home-made version of Bolognese. “So the way I make it at home is I always make it with penne pasta. And then we have minced meat with my favorite sauce in England, which is called dolmio tomato sauce. And we mix it with a lot with onions. And then I put lots of cheddar cheese on top. So, first, I dice the onions and fry them in a pan until soft. And then I take the minced meat which I buy fresh from the supermarket, normally beef rather than pork because it’s nicer. I fry the beef in a pan, then pour in the dolmio sauce, which is a sweeter sauce than others. And then I add a can of chopped tomatoes, you put it all in and let it simmer,” Abby elaborated. A: The key to a good Bolognese is simmering it very slowly over a low heat for at least 15 minutes, or for hours if you have the time. Simmering makes the beef incredibly tender.B: You can use your slow cooker. Its ability to maintain a low, steady heat for hours is perfect for a dish like this. However, remember to keep an eye on the pot and add more of the reserved tomato juices as needed if the bottom of the pot becomes dry. A: When the Bolognese is nearly finished, cook the penne pasta following the instructions on the pack. "You cook the pasta for 7 minutes then you mix it with the sauce before adding in some mixed herbs. If you don’t have mixed herbs, you can just use oregano, or basil. Just mix it all up together and grate cheese on top of it. Because it’s quite easy to make batches, normally I cook it for my whole family,” Abby added. A: You can save time by preparing the beef mixture the night before and finish cooking it with the tomatoes in the slow cooker the next day. Leftovers freeze well, so go ahead and make a huge batch of Bolognese to share with your family and friends. B: That was Abby’s homemade Bolognese recipe. How about you? 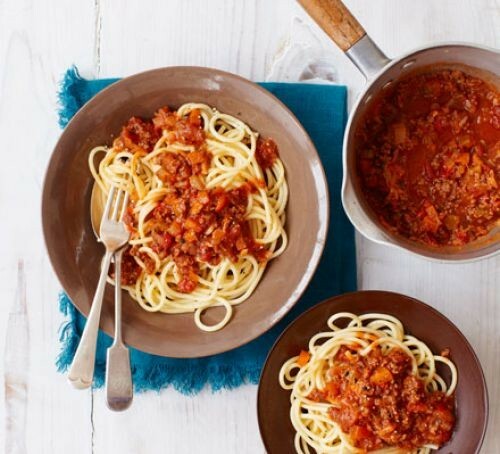 If you have a secret ingredient or impressive technique for your homemade Bolognese, just head to the kitchen, cook some up, take a picture of your results, and email us at [email protected] or tag us on Facebook at VOV5 English Section. We’d love to know your secrets for the perfect Bolognese. A: Your comments and ideas about Bolognese are always welcomed and highly appreciated. For more recipes, visit vovworld.vn/ Food-delight, where several recipes are already waiting. Join us next week for more tips on diversifying your menu. And now, good-bye.